Guest review taken from VRBO on 12/26/18 for Pili Mai 12I Amazing!!! We love staying at Pili Mai. We booked thru great vacation rentals and they were great. The unit was well stocked and clean. View of the ocean (over parking garage) was beautiful. Wish we were still there!!! Guest review taken from Airbnb on 12/28/18 for Poipu Palms 204 Location at the ocean is fantastic. Whales, dolphins and sea turtles was seen from the balcony every day. The condo is equipped with everything you need for home cooking. Falling a sleep to the sound of ocean waves was something you got used to very quick. Restaurants in walking distance or a short drive away. The rental car included was very convenient to us. Guest review taken from VRBO on 12/27/18 for Pili Mai 1L Spacious, clean, and comfortable We were very impressed by how well stocked the condo was -- adequate cleaning supplies, shampoo, etc. Nice pool area, wonderful location. The only thing that could have made it better would be to have an ocean view, but you can't have everything. It was really great and we had a wonderful time. 1 recommendation would be to get softer beds. Our stay was incredible other than having stiff backs. The beds are the hardest we can ever remember sleeping on. Truly a wonderful property though! ---MANAGER'S RESPONSE: Mahalo for the feedback! We will share this comment with our team and have it addressed! We had some wireless problems, and staff came and fixed it promptly. I really liked the digital guest book--lots of very helpful information. Love the Athletic Club membership--a great place to stay on the final day so we didn't have to board the plane covered with salt and sand! ---MANAGER'S RESPONSE: Mahalo, Jenny! The club is definitely a nice perk on top of having the beach minutes away. We hope to stay current with our digital guest books and we'll continue to look for ways to stay ahead of the pack. Again, thank you, Jenny! Great place! Very comfortable beds, lots of common space for game playing, talking, watching videos. The beach toys, chairs, umbrellas, etc, were a nice plus. The property is very conveniently located a short walk from the beach, in a quiet, beautiful neighborhood. You can even see the sunset from the deck! ---MANAGER'S RESPONSE: We're happy you were able to enjoy all of the amenities, especially the Poipu Beach Athletic Club! Kiahuna Plantation is a gem in Poipu and at this time of the year when it's cool throughout the evening, it's the perfect spot to hit the beach during the day and kick-back at night. Mahalo, Jenny, and we look forward to working with you again! 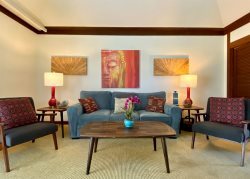 Guest review taken from Airbnb on 12/23/18 for Kahala 132 The space and location are perfect! Poipu beach is a five minute walk and a great restaurant bar scene is within easy walking distance. The pool and hot tub are super convenient and just around back from the front steps. Street noise was not an issue at all as the road definitely dies after the sun sets. Poipu beach is one of the few in Hawaii where the turtles come out to sleep at night - we toasted at least 6 of them nightly (they come out at sunset... give them 10 ft though and please dont shine lights/flash-photos at them - theyre sleeping). There wasnt anything negative to mention in regards to what we were looking for. The price was great and the space was perfect for two. The two bathroom sinks are separate from the one toilet and shower so a group of 4 could get along fine. The tub takes 2 full charges of the hot water heater to fill, but the hot water heater reheats in less than 10minutes... and the hot tub is honestly 40 steps from the front door. We loved our stay!!!! Guest review taken from Airbnb on 12/24/18 for Hale Pohaku Kai I don't know how you beat this total package. The house is plantation living at it's best. Sit on the lanai and watch the sunset and feel the ocean breeze or cross the street to the ocean for a sunrise walk along the path. It's plantation living with all the amenities. Even boogie boards for the body surfers. The welcome cookies and goodies were a thoughtful touch. The location is ideal. A 5 minute walk to the Sheraton beach where we enjoyed our first surf lesson, and all managed to get up on the board. The best local and higher end restaurants are a plenty at two shopping areas within a 5 min drive and Old Koloa town is right up the road. Five stars and then some. Guest review taken from Airbnb on 12/23/18 for Kiahuna plantation 313 Our stay at this condo was wonderful! Everyone I communicated with at GVR was very friendly and accomodating, even bringing an extra comforter for the bed when I requested one. The condo itself is slightly outdated but still well maintained, and comes properly equipped with everything you would need to function in a full scale living space. You can't beat tge location with Poipu and there is a complimentary rental car through the booking which just helped to take one more task off my list! Overall, I would recommend this to anyone looking to visit Kauai! Guest review taken from Airbnb on 12/22/18 for Kiahuna Plantation 431 This was the best experience Ive ever had for a vacation. My wife and I came for 9 days for our honeymoon and they left a bottle of champagne and a balloon for us. The place had all the amenities you would need and was cozy and comfy. Plus the free rental was the best deal on the island. We upgraded to a Jeep which was $25/day and well worth it. Will use this company for every vacation from now on! A million thanks again! (1) Everyone we spoke with was friendly and tried to be (generally, was) helpful. Very nice. (2) As some will recall, we had a late-arising health crisis for my wife -- which resolved happily, and despite surgery, allowed her and us to make our trip. But when the problem arose, it looked very doubtful we would be able to. I spoke with team members, including Linda, and as per above, everyone was friendly and sympathetic. But I'm pretty sure that one request I made was not honored: We didn't have travel insurance, and less than a week before the trip, re-renting efforts, as requested, hadn't been successful. But I had asked (more than once) that GVR contact the owner(s) to see if, failing re-rental and if we couldn't come, the owners might -- as many VRBO owners would, I'm told by VRBO, and as many decent humans might -- be willing to offer us some accommodation for our (prospectively) lost $3000+ vacation. Like a partial refund, or a discount on a future visit. And I'm pretty sure no one ever took that request to the owner(s). We know they wouldn't have had to agree; but I think the request should have been made. (3) The internet. As in my VRBO (positive) review: I think a management firm with many properties should always have, on stock, at least one set of modem/router equipment that could be plugged promptly in to failing internet at its properties -- so that once the ISP checked online (as they all can do) and verified a proper signal sent and received, the maintenance team could promptly install new stuff and get it going. Instead, while the gentleman who came by (twice) and Angela in the office were both very nice, the bottom line your practices left us with was that it would take at least 4-5 days for the ISP rep to come out and look at (your/the owners') failing equipment. Given that cell service was quite spotty for us at this location, this left us without access from "our" vacation home for the last 3 days, which wasn't right -- and could have been avoided. (4) Maintenance/cleanliness: The place was (as per VRBO review) clean when we arrived, in all the most important ways. But it was clear that less than everything had been cleaned anytime recently -- e.g., the tracks on the sliding screen and glass doors. Lots of gunk there. As a result, and/or from lack of checking/alignment, the screen door was very hard to slide into proper placement. Among other things, this meant there was sometimes too big a gap between sliding doors which effectively invited moths and other bugs in at night when attracted by the lights inside. . . ---MANAGER'S RESPONSE: We apologize if communication was not perfect. We did indeed inquire about a partial refund and discount, but came up unsuccessful. We understand it is a sensitive situation. We view all issues with an objective point-of-view in order to be fair for all. We've learned that dealing with particular problems on a case-by-case basis would prove to be helpful, especially for unique cases like this. We know that all equipment are bound to fail after a period of time, so with that said the course of action should have been different. You are right, next logical step would have been to replace the failing equipment. We will work with management on contingency plans when it comes to issues like these. The maintenance and cleanliness will be revisited and the appropriate departments will take the necessary steps to complete the items that you have mentioned with the tracks and sliding doors. We appreciate the feedback and we will continue to improve as we grow as a business and team. Mahalo, Robert! A gorgeous location, a very nice and comfortable unit, and a group of friendly and responsive people doing the management. We enjoyed our stay, and would be very open to returning! Thanks for your consideration. The caveats above are mostly NOT in our VRBO review, as we assume, how friendly and responsive your team is, you'd want to be able to address these things directly, without needing a public "airing." ---MANAGER'S RESPONSE: Your message will be shared with the entire team and addressed, appropriately. We look forward to working with you again and finding the best property that will fit your needs! Mahalo, Robert! The only issue was the apartment above ours had kids that spent the day running and jumping on the floor above us. We heard a fair amount of foot traffic from this. Guest review taken from Airbnb for Regency 120 on 12/18/18 This Airbnb was exceededecery expectation, and is one of the nicest and place I've ever stayed. I comfortably would house 6 people, and could do even more than that if sofas and other common spaces were utilized. Great Vacation Retreat's communication, hospitality, and thoughtfulness could not be any better. Their accomodations, including an entire closet full of beach supplies (towels, chairs, umbrellas, etc.) Was perfect for a family traveling out of town. We even left an iPad behind accidentally, and they mailed it to our house in the continental U.S., no questions asked. I do not have anything but superlatives to stay about this Airbnb and its hosts, and recommend them to anyone looking to stay in Kauai/ Poipu ! Everyone at GVR was amazing to deal with! Professional, knowledgeable, and extremely friendly and helpful! MANAGER RESPONSE: Mahalo! Very friendly and accessible! Made our vacation completely worry free! Beautiful property, GVR pampered us and made our experience unforgettable. Thank you GVR!!! MANAGER RESPONSE: Thank you for being such great guests! All members were friendly and prompt in replying (by phone and email) to our many inquiries prior to our arrival. Their advice and suggestions and handy resources prepared us for one of our best vacation experiences ever! MANAGER'S RESPONSE: Mahalo for staying with us! We look forward to your return! Beautiful stay in a lovely resort! Dream vacation complete with carefree condo that we could really relax in and enjoy with our friends and family! MANAGER'S RESPONSE: Mahalo for staying with us! We look forward to your return! We were impressed with all aspects of our experience with Great Vacation Retreats! The process to get the rental car that was included was smooth and pain-free. The GVR office was also very gracious and responsive to our questions! The Airbnb was spacious and would have been perfect for a family of 4. With the windows open, you can hear the cars drive by in the morning and the noises from the pool but it was not too disruptive. The location is within a 5 min walk to both Brennecke and Poipu Beaches. If you get the Poipu Athletic Club membership, it is not located on site but is about 1/2 mile away! My wife and I enjoyed the use of the Athletic Club to play tennis, ping pong, and work out. Again it would be a great options for families! Exactly as described. It was a fantastic vacation experience. I would highly recommend to anyone.